Test the crispiness, firmness and flexural strength of you cereal products. When combining the TA1 texture analyzer with one of our Kramer-type shear cells, you obtain a greater repeatability when bulk testing a sample. 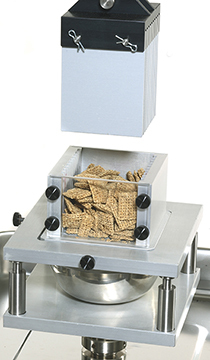 The greater repeatability will average out the variation in the product that would be measured by testing each individual piece of cereal. Firmness, hardness, crispiness, chewiness, flexural strength and shear are just a few of the test types that you can perform with our food grips and fixtures for cereals.